Poor planning of a joint military exercise in Europe led to a loss of separation between a Fokker 70 passenger jet and a U.S. Air Force F-15 fighter. A risk of collision existed, according to an investigation by the Dutch Safety Board. On April 19, 2012, a Fokker 70 of KLM Cityhopper operated on a passenger flight from Amsterdam Airport Schiphol in the Netherlands to Sandefjord Airport in Norway. The flight was routed over the North Sea at FL350. Southwest of the island Sylt in Germany, an F-15C fighter aircraft came in close proximity of the Fokker 70. There was danger of a collision. 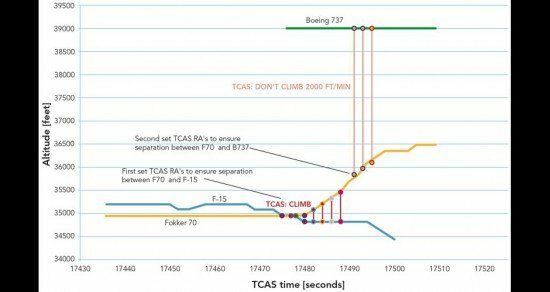 The Traffic alert and Collision Avoidance System (TCAS) of the Fokker 70 generated a resolution advisory to climb, whereupon the crew performed a climb to avoid a possible collision. The pilot of the F-15C took avoiding action as well. The F-15C participated in the international air force exercise Frisian Flag which took place from Leeuwarden Air Base in the Netherlands. Both aircraft continued their flight uneventfully. The minimum lateral distance between both aircraft was 0,39 NM (722 metres) with a difference in altitude of 512 feet (156 metres). The Dutch Safety Board concluded that during the preparation of the air force exercise it was assumed by the exercise staff who organised the exercise that the assigned German airspace was available for the exercise without restrictions. As a result no adequate measures were taken to ensure separation between participating and non-participating traffic. During the first two days of the exercise, after civil traffic had been observed in the exercise area, the staff did not take adequate action to avoid this to reoccur. The Royal Netherlands Air Force performed a risk analysis for the total exercise. However the increase in available airspace above FL240 in Germany was not sufficiently seen as a risk. The German authorities, which were involved in the preparation of airspace matters for the air force exercise, had the duty to inform the exercise staff about the characteristics of the airspace concerned in their country and the presence of airways. This was not done sufficiently. The exercise staff had the duty to gather more information about the airspace concerned. This was neither done. The actions of the fighter control coordinator, who was responsible for the coordination tasks and application for the airspace for the exercise, were not checked thoroughly by another member of the exercise staff or somebody outside the staff. The location of one of the regen airfields had been planned close to the airway UN873. This was possible because the exercise staff was not aware of the presence of the airway. 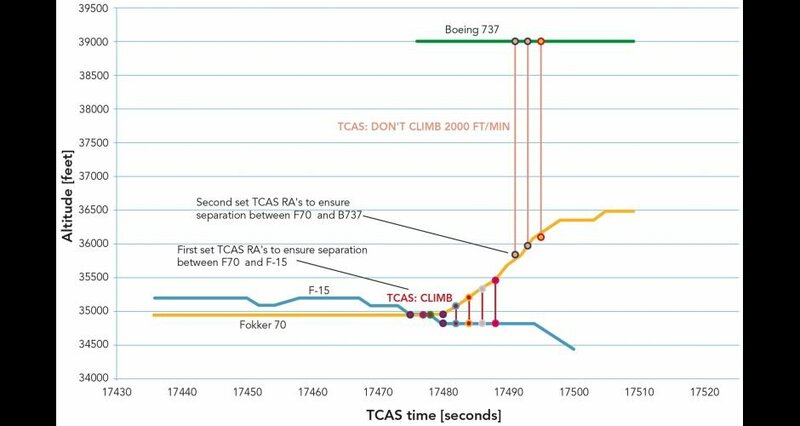 The F-15C pilot did not adhere to the restriction to stay at or below FL320. The fighter controller, who had expressed his concerns regarding the conditions of the exercise, was not able to handle the traffic situation, used non standard terminology and lost the ability to support the exercising aircraft with regard to collision avoidance. The Dutch Safety Board complained about the lack of cooperation by USAF Europe because they refused to answer questions that were relevant to the investigation.